The stunning figure represents roughly a quarter of households of military members on active duty, the Reserves or the National Guard. Also this month, a new report found that the nation’s food pantries serve 620,000 families with a member in the military—another troubling indication that service members battling against poverty must often rely on the generosity of our charities. The stunning figure, which represents roughly a quarter of the households of military members on active duty, the Reserves or National Guard, shows that even as the United States purports to wind down its operations in Iraq and Afghanistan and soldiers return to civilian life, they are resettling into a hostile economic climate, on a precarious landscape of joblessness and debt. The data comes from an extensive quadrennial report published by Feeding America, a national network of tens of thousands of food aid groups and programs. 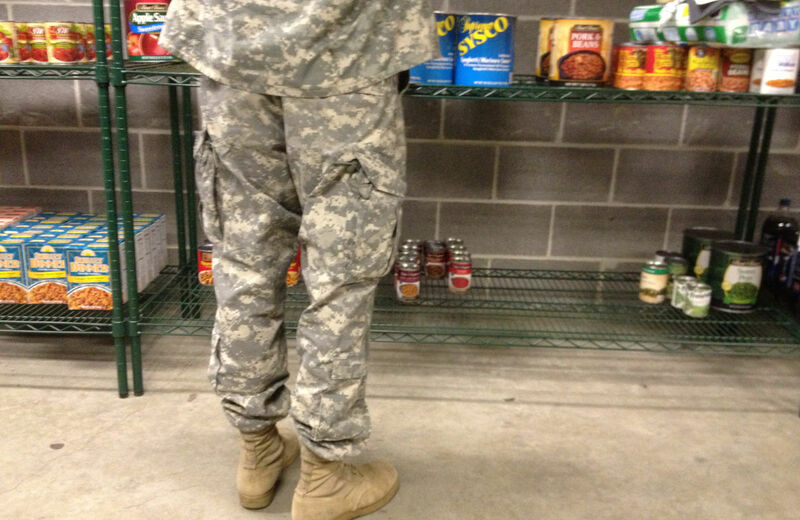 The study also found that one-fifth of the households served by the food pantry network had a member involved with the armed forces, either currently serving or a veteran. Feeding America spokesperson Maura Daly tells The Nation that the numbers reflect trends that local partner organizations have been observing anecdotally. “What we’re seeing in the data… is indicative of many working poor families in America, where one income is supporting an entire household and multiple needs,” Daly says. For the client population generally, over half the households served have at least one member who is employed, yet nearly three-quarters live in poverty. They’re caught in a knot of impossible choices: as they stretched their monthly budgets, about two-thirds were torn between paying for either utilities or for food, or between food and medical care. In the San Diego area, where 27 percent of the households served by Feeding America have a current or former military member, Jennifer Gilmore, executive director of Feeding America San Diego, tells The Nation via email that from the local clients they serve, “we have heard that struggles are associated with the higher cost of living in certain areas and difficulty for family members to hold steady jobs amid transfers and deployments.” Veterans may face even worse hardships, scraping by on meager disability payments and retirement funds. The Pentagon has disputed Feeding America’s methodology, suggesting that its statistical definition of military households was imprecise, but everyday tales of wrenching family struggle keep bubbling to the surface. It’s pure embarrassment. I hate it. I don’t like it. It’s like taking away the pride you have and making you humble… You have to go there and I hate to say it, but it makes you feel like you’re begging for food.… Why can’t there be some type of program to help us out? We didn’t do anything wrong. We come out of the military, next thing you know we’re left to fend for ourselves and you just can’t make it. Feeding America’s findings parallel other studies revealing extraordinary levels of hardship among military families. Operation Homefront, a charity serving low-income military households, recently reported that requests for food assistance had for the past several years stood at “nearly triple the pre-recession levels of 2008,” and requests for help with utilities bills and housing costs had also tripled. According to a recent health study of post-9/11 veterans in Minnesota, over a quarter reported experiencing food insecurity in the past year, nearly twice the national rate. Young male veterans from the post-9/11 war era face severe jobless rates; veterans age 18 to 24 hover around 24 percent, compared to 16 percent among nonveteran peers. And so far, federal policies to encourage private businesses to hire newly returned veterans have not significantly dented the post-military jobs deficit. Jobless veterans may soon fall into an even deeper hole. Thanks to congressional gridlock, as of late June long-term emergency unemployment benefits had lapsed for nearly 300,000 veterans who have been unemployed for more than twenty-five weeks, according to the Center on Budget and Policy Priorities (CBPP). Many veterans and their families are also getting squeezed by harsh cuts to food stamp benefits that kicked in last November, when Congress failed to restore critical stimulus funding. The cutbacks have affected some 900,000 veterans, according to the CBPP. A typical family of three could see their benefits drop by about $30 a month. When dealing with chronic joblessness or poverty wages, veterans—be they just-returned Iraq troops or aging pensioners—might resort to a neighborhood food pantry regularly to tide them over between benefits payments. Meanwhile, data on sales at military-based grocery stores indicates that food stamp usage by military households at the commissaries reached an all-time high in 2013, after climbing dramatically since 2007. As for those currently serving, a steady paycheck from Uncle Sam hardly guarantees economic security. A 2010 federal survey showed more than eight in ten service members reported “$10,000 or more in credit card debt, a mortgage, or a car loan,” and “one-third indicated that they had trouble paying monthly bills.” Service members are also vulnerable to a shady predatory lending industry that specializes in bilking military households. Financial strains are both a symptom and a cause of deeper social and psychological troubles that plague countless military families, such as depression, substance abuse, post-traumatic stress disorder, brain injuries—all exacerbated by an inadequate healthcare infrastructure and the stress of debt and poverty. With so many risks weighing on low-income military families, not even a decent meal can be taken for granted. Soldiers are no more deserving of basic food security than anyone else, of course—no one should have to suffer food insecurity. But it’s both predictable and tragic that so many of the people who are commissioned to secure the country must return home to fight for survival in their own communities.